In a move surprising to some, the SEC has announced that a number of cryptocurrency exchanges must register with the agency. Without naming names, the race has begun to determine if a specific platform meets the definitions put forward by the SEC. As our readers are aware, this is actually not surprising at all. In fact, it is only one small step in a broader trend recognizable in the Bitcoin market. How this specific event translates into the current trading conditions is what’s most interesting from a trader’s perspective. And we have indeed seen one specific change which may influence your profits. Online trading platforms have become a popular way investors can buy and sell digital assets, including coins and tokens offered and sold in so-called Initial Coin Offerings ("ICOs"). The platforms often claim to give investors the ability to quickly buy and sell digital assets. Many of these platforms bring buyers and sellers together in one place and offer investors access to automated systems that display priced orders, execute trades, and provide transaction data. A number of these platforms provide a mechanism for trading assets that meet the definition of a "security" under the federal securities laws. If a platform offers trading of digital assets that are securities and operates as an "exchange," as defined by the federal securities laws, then the platform must register with the SEC as a national securities exchange or be exempt from registration. The federal regulatory framework governing registered national securities exchanges and exempt markets is designed to protect investors and prevent against fraudulent and manipulative trading practices. The statement seems to have been received rather negatively by Bitcoin enthusiasts but we would want to shield you from excessively emotional reactions. Jumping to rash conclusions is relatively easy when a government agency moves to regulate digital currencies but is this really a sign that the market is going to cave in momentarily? We sure doubt it. Do you remember the BitLicense? In case you don’t, it is a license granted by the state of New York to businesses operating in the digital currency space. Neither the announcement nor the introduction of the BitLicense seemed to have any lasting effect on the Bitcoin market. So, assuming that the introduction of new regulations has to kill Bitcoin doesn’t bear out under any reasonable judgment, as far as we’re aware. That’s the angle some commentators tend to forget but it’s a part of our daily activities to remember similar past situations, their potential implications for the present and to summarize them for you. How the market reacts to such news is a completely different story and possibly the most important piece of the puzzle today. On the short-term BitStamp chart, we see that the action in the last three days has been an acceleration after the previous days of back-and-forth movement. Perhaps the most obvious thing is that Bitcoin went back below $10,000 increasing the profits on our hypothetical short positions. While this level doesn’t have any inherent meaning for the currency, it might have meaning for traders and investors. Put simply, people in the Bitcoin market might view round numbers as kind of “special,” much the same way people do in general. After all, a 100-year anniversary somehow seems more important than the 99 or 101-year one. This is important because traders might see Bitcoin crossing $10,000 as an important development. Specifically, in the current conditions when Bitcoin is back below this level, traders might become convinced that the whole move up is over. If this is the case, they might sell, further fueling downward momentum. This is not automatic, but we definitely see the move below $10,000 as a weak bearish indication. Why weak? Because it would have to be confirmed by a more substantial move down but before this confirmation is seen other bearish factors would come into play. The second thing that you might find on the short-term chart is the fact that Bitcoin is now below the trend line based on the very recent rebound. 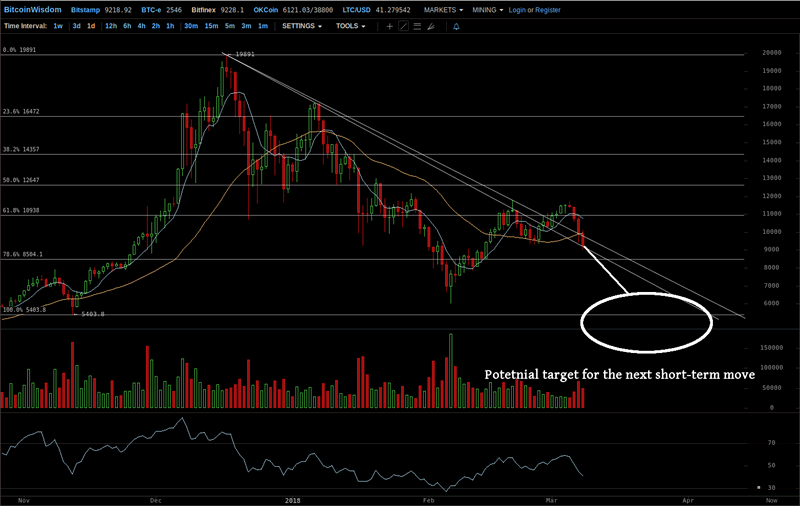 The move down below this line might mean that Bitcoin has broken resistance and is now ready for more declines. The move below the rising trend line is also a weak bearish indication. Again, why a weak one? Mostly because of the fact that trend indication based on short-term time frames are generally less significant than long-term indicators. We do mention these weak indications as they might be more sensitive to changes in the environment and, combined with other perspectives, can give you and edge in the first part of the possible decline. The last short-term indication and possibly the most important one is the change we mentioned in the opening paragraph of this alert. Namely, the market has started reacting to potentially negative news in the usual way. In the past, we wrote that Bitcoin hadn’t really reacted to alleged negative news from the SEC (this was before the current SEC statement came out). This was a potential bullish indication but it is no more. Traders view news of regulation as negative and react by selling, so it seems we’re back to normal. Altogether, the three bearish short-term indications leave us with a bearish view for the short term. It also means that the current profits on our hypothetical short positions might grow further. Now, let’s get to the long-term perspective. On the long-term Bitfinex chart, we see that several bearish indications remain in place. First and foremost, the 38.2% is relatively far away. This means that the most important bearish Fibonacci retracement is firmly in play. This is the yardstick we measure other bearish indications against and right now it seems we’re miles away from it and the situation is still bearish. Second, after a brief period of flirting with the 61.8% Fibonacci retracement, Bitcoin seems to have broken up with this level and moved on. We are now at the levels of the previous local low. Quite importantly, if the move down is continued beyond this low, we don’t have any important retracement all the way down to around $6,000 – the most important recent low. In other words, the next move to the downside might get you a lot of bang for your buck. Third, depending on how you draw your declining trend lines (that’s why we have two such lines in the chart above), Bitcoin is now either back below the declining trend line or right at it. 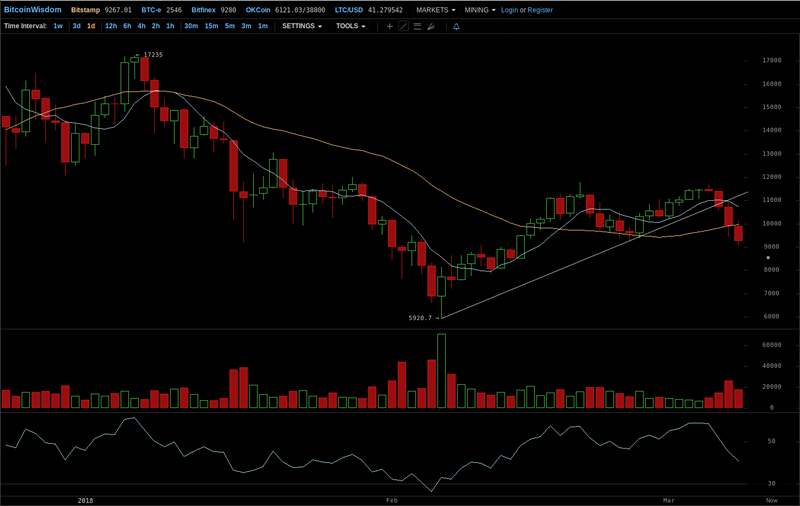 What this means is that in spite of the recent move up, Bitcoin has been moving in line with the trend. If this persists, Bitcoin might be likely to move down some more. We still have to wait for the move below this line to be confirmed by more daily closes before the bearish case becomes really strong, but this is precisely how the beginning of the next big move to the downside could look. As a side note, the volume has picked up and the action is now more hectic than it was a couple of days ago. If we hadn’t had a hypothetical short position, we might not have had time to put it on to catch the current move. This is also the case even if this move is not yet the beginning of the slide (one can be never 100% sure in the market) – it might be worth it to wait out a temporary move to the upside to really roll with the move down. Sometimes, we have to go against the tide just to ride it out.